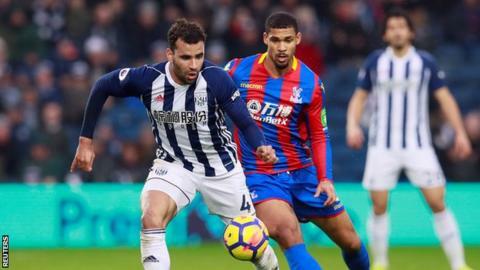 Alan Pardew praised the "endeavour and organisation" of his players as his first match as West Bromwich Albion manager ended in a goalless draw with Crystal Palace, who moved off the foot of the Premier League. Pardew's new side had the better chances in a match he said they "bossed" against the club that sacked him last Christmas after a poor run of form. Hal Robson-Kanu and Jay Rodriguez had the best of them, but could only force Palace goalkeeper Julian Speroni into routine saves, while Joel Ward's block stopped Sam Field. Speroni was only called into the team when Wayne Hennessey was injured in the warm-up. "If we work like that every week, I'll be pleased," said Pardew. "We lacked a bit around the box but in terms of effort, we were very good. "We bossed the game, except for one spell." The Eagles' best chance fell to Christian Benteke, who had a shot tipped behind by Ben Foster after skipping past three Baggies players. While a point moves Palace up the table, they have now gone a Premier League record 10 away games without scoring. There must have been a wry smile on Pardew's face when he realised who he would face in his first match as West Brom boss. The 56-year old was sacked by Palace 345 days ago, but returned to work on Wednesday, replacing Tony Pulis at The Hawthorns on a deal until 2020. His predecessor was dismissed after 10 games without victory - a run that has stretched to 13 with this result and two games overseen by caretaker Gary Megson. "Some composure and we might have won," added Pardew. "We were really good in the second half. I'm looking forward to working with the guys." While the Baggies stay 17th in the table, one place above their opponents, there were positives to be taken. In defence, they arrested a run of 10 games without a clean sheet, and created plenty of opportunities at the other end. The latter was facilitated by a more attacking line-up, switching from five at the back to 4-3-3, with Robson-Kanu, Rodriguez and Salomon Rondon the focal points. And the Venezuelan Rondon could have won it at the end had he not headed wide with the goal at his mercy. Given that they have been bottom of the table since the opening day, Palace will settle for this imperfect point, which takes them up to 18th. Roy Hodgson's side had to contend with a far-from-ideal build-up that consisted of a delayed train, illness to Scott Dann, and Hennessey's injury in the warm-up. "The scenario couldn't have been much worse." said Hodgson. "But I'm really pleased with the way we played and it was a well-deserved and valuable point. "We were lucky nothing happened to Julian Speroni as we don't know who'd have played in goal. "Wayne's back went into spasm. It's not the first time it's happened. We're not blessed with back spasms, we had Ruben Loftus-Cheek too." But it did not stop them securing a second successive away clean sheet in the Premier League for the first time since January 2015 - and perhaps accounted for their willingness to settle for a point as time ticked on. On a day of reunions, Hodgson returned to The Hawthorns as an opposing manager for the first time since leaving for the England job in 2012. His 14-month tenure saw him steer them away from relegation before delivering a 10th-place finish a year later. Of the warm reception he received, Hodgson said: "To get that reception as an away manager was touching. I'm really grateful for it. It put the biggest smile on my face for a long time." The gap to a position of safety stays at three points but this result, coupled with the midweek draw at Brighton, should give Hodgson plenty of heart. Pardew became the fifth manager to take charge of at least five different Premier League clubs. He has won three and drawn two of his opening games with his five sides. Palace are the first Premier League team to fail to score in 10 consecutive away games (D2 L8). The Eagles are the first English top-flight team to go 10 away games in a row without a goal since Manchester City in 1950 (12 games). West Brom attempted 20 shots, their highest shot tally in a Premier League game since December 2015 against Newcastle (22). Palace have kept consecutive away Premier League clean sheets for the first time since January 2015. The Baggies have taken 32 points from their 34 Premier League games in 2017 (W7 D11 L16), the fewest total of any Premier League side to appear in the past two seasons. Alan Pardew's second game as West Brom boss sees the Baggies go to Swansea on Saturday, 9 December (15:00 GMT). On the same afternoon, Palace entertain Bournemouth at Selhurst Park (also 15:00 GMT). Match ends, West Bromwich Albion 0, Crystal Palace 0. Second Half ends, West Bromwich Albion 0, Crystal Palace 0. Allan Nyom (West Bromwich Albion) is shown the yellow card for a bad foul. Foul by Oliver Burke (West Bromwich Albion). Bakary Sako (Crystal Palace) wins a free kick in the defensive half. Sam Field (West Bromwich Albion) is shown the yellow card for a bad foul. Foul by Sam Field (West Bromwich Albion). Substitution, West Bromwich Albion. Oliver Burke replaces Jay Rodriguez. Attempt missed. James McClean (West Bromwich Albion) left footed shot from outside the box misses to the left. Assisted by Ahmed Hegazi with a headed pass following a set piece situation. Sam Field (West Bromwich Albion) wins a free kick on the left wing. Attempt blocked. Sam Field (West Bromwich Albion) left footed shot from the left side of the box is blocked. Assisted by Jay Rodriguez. Substitution, Crystal Palace. Bakary Sako replaces Andros Townsend. Foul by Jay Rodriguez (West Bromwich Albion). Attempt missed. Salomón Rondón (West Bromwich Albion) header from the centre of the box is close, but misses to the left. Assisted by Allan Nyom with a cross. Attempt blocked. Salomón Rondón (West Bromwich Albion) right footed shot from the centre of the box is blocked. Assisted by Jay Rodriguez. Attempt missed. Andros Townsend (Crystal Palace) right footed shot from outside the box is high and wide to the right. Assisted by Ruben Loftus-Cheek. Attempt missed. James McClean (West Bromwich Albion) left footed shot from outside the box is high and wide to the left. Substitution, West Bromwich Albion. James McClean replaces Hal Robson-Kanu. Delay in match Ahmed Hegazi (West Bromwich Albion) because of an injury. Attempt saved. Hal Robson-Kanu (West Bromwich Albion) left footed shot from the left side of the box is saved in the centre of the goal. Assisted by Sam Field. Offside, Crystal Palace. Andros Townsend tries a through ball, but Ruben Loftus-Cheek is caught offside. Attempt blocked. Andros Townsend (Crystal Palace) left footed shot from the left side of the box is blocked. Assisted by Ruben Loftus-Cheek. Offside, West Bromwich Albion. Kieran Gibbs tries a through ball, but Salomón Rondón is caught offside. Jake Livermore (West Bromwich Albion) is shown the yellow card for a bad foul. Foul by Jake Livermore (West Bromwich Albion). Attempt blocked. Sam Field (West Bromwich Albion) left footed shot from a difficult angle on the left is blocked. Attempt saved. Salomón Rondón (West Bromwich Albion) right footed shot from a difficult angle on the right is saved in the bottom left corner. Assisted by Jay Rodriguez.